Under the framework of joint projects with the Business Development Centre (BDC) and the Development and Employment Fund (DEF) which aim to promote an entrepreneurship culture among Jordanian youth, the ILO continues to roll out the KAB programme in vocational and technical education with the assistance of the Ministry of Education and the Vocational Training Corporation. 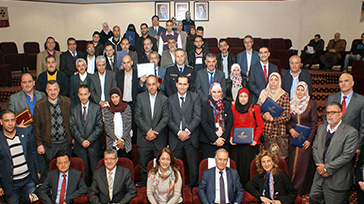 On 25 February, Enterprise Specialist at the ILO Regional Office for Arab States Rania Bikhazi, together with DEF and the VTC, held the KAB certification ceremony at the VTC premises in Amman. During the ceremony, 19 KAB National Facilitators, three supervisors and two KAB coordinators from both VTC and DEF were awarded certification. The ceremony was held under the patronage of the Minister of Labour represented by Mr. Abdallah Freij, Director General of DEF, who chaired the event. On 5 March, a meeting was held at the Ministry of Education chaired by H.E. Mr. Mohammad Thneibat, in the presence of 24 school directors, KAB teachers and a number of ministry officials. ILO provided a detailed presentation of the KAB programme and BDC highlighted the national pilot experience that reached a total of 72 facilitators and approximately 1,569 students. sending an official letter from the Ministry of Education to each school to ensure the roll out of the programme. continue the second phase of dissemination by introducing it to 10th and 11th grades. On the same day, the ILO awarded certification to 24 KAB National Facilitators, two supervisors from the Ministry of Education and two coordinators (one from BDC and one from the MoE).